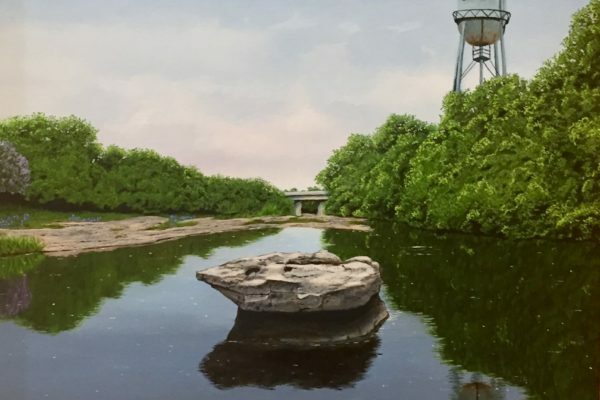 Plein Air Round Rock was founded in July of 2016 by local plein air artist, Amie Gonser, who wanted to connect with other artists who shared her own love for painting outdoors. The group presently has 150+ members and about fifteen members who actively participate in monthly paint outs. Once a month, the group meets at locations in and around Williamson county to paint the beauty of our Texas landscape and architecture. Plein air painting offers many challenges. Artists must deal with changing light and shadow, unpredictable weather, insects and other animals, as well as curious onlookers. These are just some of the things that make plein air painting so exciting. Each outing is a new and fresh adventure, resulting in paintings which capture the story of a specific time and place. This is our first art exhibit hosted at The Williamson Museum on the Chisholm Trail.